There is an El Niño in full swing which helps push average global temperatures higher, and records are being broken, but just how hot is it? For several years, we have heard that global warming has pushed temperatures higher by around 0.8 to 0.85 degrees Celsius (°C). Even before this year's strong El Niño developed, 2015 was a hot year. The first few months of the year broken records for the hottest corresponding period in previous years all the way back to the start of the instrumental record in 1880. Each month, new records fell. 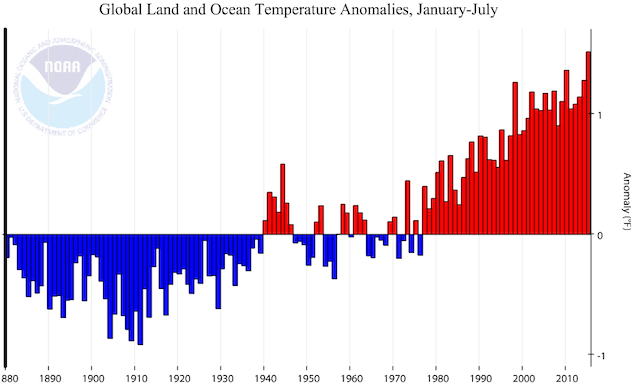 The July average temperature across global land and ocean surfaces was 0.81°C above the 20th century average. As July is climatologically the warmest month for the year, this was also the all-time highest monthly temperature in the 1880-2015 record, at 16.61°C, surpassing the previous record set in 1998 by 0.08°C. The July globally-averaged sea surface temperature was 0.75°C above the 20th century average. This was the highest temperature for any month in the 1880-2015 record, surpassing the previous record set in July 2014 by 0.07°C. The global value was driven by record warmth across large expanses of the Pacific and Indian Oceans. The year-to-date temperature combined across global land and ocean surfaces was 0.85°C above the 20th century average. This was the highest for January-July in the 1880-2015 record, surpassing the previous record set in 2010 by 0.09°C. In addition the year-to-date globally-averaged land surface temperature beat the previous record in 2007 by a whopping 0.15°C, and the year-to-date globally-averaged sea surface temperature surpassed the previous record of 2010 by 0.06°C. Every major ocean basin observed record warmth in some areas. And, as Joe Romm has reported, "It was especially hot for the 6 billion of us up here in the northern hemisphere, where the first seven months of 2015 were a remarkable 0.3°F (0.17°C) warmer than the first seven months of any year on record — and nearly a half degree Fahrenheit warmer than any year before 2007". So this year, records are not being broken. 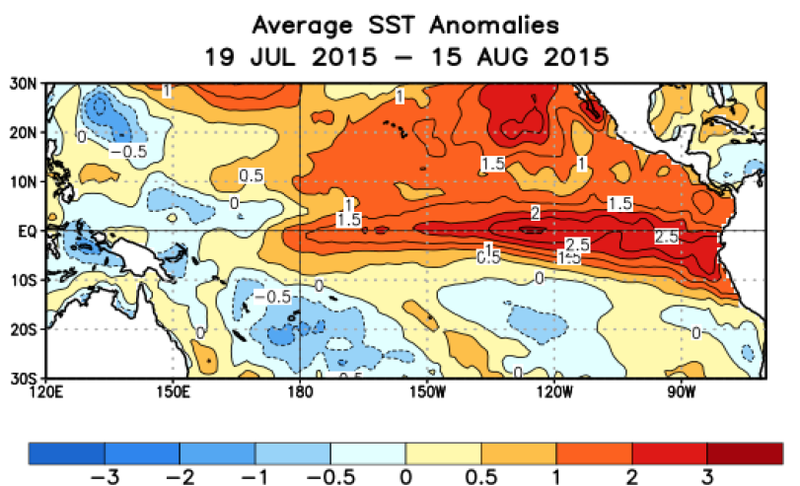 They are being smashed, as a strong El Niño (and perhaps the strongest on record) is set to persist through to 2016. El Niño conditions are characterised by a warm band of water across the eastern tropical Pacific Ocean and facilitate the transfer of heat from the ocean surface layer to the atmosphere and are associated with a hotter climate. 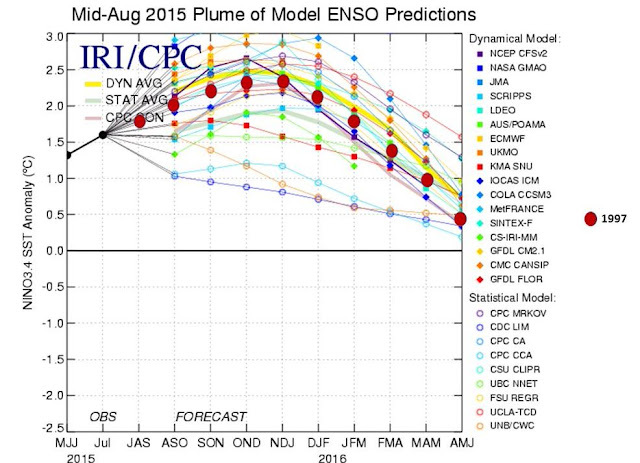 All multi-model averages suggest that El Niño 3.4 will be above +1.5ºC (a “strong” El Niño) during late 2015 into early 2016. (El Niño 3.4 is the zone of longitudes 120 to 150W along the equatorial Pacific Ocean). As the chart above illustrates, the projected strength of the El Niño (yellow line) is slightly above the previous strongest such event in 1997 (red dots). So hot will 2015 be? The NOAA has already reported that the first seven months of the year was almost 0.1°C above the previous record. This is a huge amount in a field where changes are often measured in one-hundredths of a degree. With a 90% chance of the El Niño persisting into 2016, it is as close as a certain bet can be that 2015 will be the hottest year on the instrumental record. We can already predict that the 2015 global temperature will exceed the prior warmest year (2014) by an unusually wide margin (~ 0.1°C), exceeding 1998 (“El Niño of the century”) even further. And there is a good chance that 2016 will beat 2015 to become the hottest year on record. But much hotter has it got already? The convention is to talk about the amount of warming "above pre-industrial", that is, before the steam-and-coal industrial revolution, around 1750. But the instrumental record used by the major agencies in the US, the UK and Japan does not start till 1880, and it is this period that is often used to provide a "pre-industrial" baseline. So when we hear that warming so far up to (the average of) the last decade as being 0.8°C or 0.85°C, it is the warming from a 1880 baseline (see light green column in figure below of 0.87°C, based on the NOAA dataset since 1880). But the climate around 1750 and 1880 were not the same. Research using proxy data and modelling shows that between 1750 and 1880 the global average temperature increased by ~0.2°C. When that is added (dark green column), we find that the real warming from pre-industrial 1750 to the average of the last decade is 1.07°C. It is a shock to see that we are more than half way to the unsafe 2°C "guardrail" favoured by international policy-makers. The warming over 1750 pre-industrial to 2014 was 1.17°C. 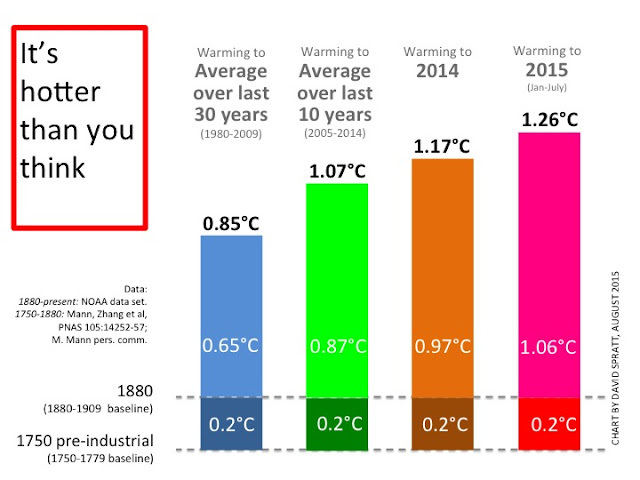 And for the first seven months of 2015, the margin is a staggering 1.26°C higher than the pre-industrial level. Yes, it is a strong El Niño period, and it may drop back for a short while, but 2016 could be just as hot and we may be entering a new phase of accelerated warming. Greenhouse emissions continue to soar to record levels, and attempts to clean up and retire some of the world's dirtiest coal power plants may result in a lowering of the production of aerosols (including black-carbon soot, organic carbon, sulphates, nitrates, as well as dust from smoke, manufacturing and windstorms) which at the moment provide a temporary (~1 week) cooling of 0.8-1°C. The leading climate researcher Michael E. Mann says that as fossil fuel use is curtailed, the aerosol cooling impact will lessen. Mann says that "if the world burns significantly less coal…we would have to limit CO2 to below roughly 405 ppm", a level we will reach in two years. A climate emergency requiring levels of action far beyond anything that is currently perceived by policy makers? As temperatures soar to record levels and it is hotter than most people understand, you can bet on that. This would be a great plenary address for the climate change talks in Paris....other than sucking trillions of tonnes of CO2 out of the atmosphere and this is achieved before we have a blue water event in the Arctic, we ned to embrace abrupt climate change with all its attendant problems.